Interview with Michael Haykin and Matthew Barrett on "Owen on the Christian Life"
Drs. Michael Haykin and Matthew Barrett were recently interviewed by Dr. Fred Zaspel of Books at a Glance. Click here to listen or read a transcript of the interview, as they discuss the Puritans, John Owen, and the Christian life. Interview with Matthew Barrett and Michael Haykin on "Owen on the Christian Life"
Recently, Pilgrim Radio interviewed Dr. Matthew Barrett and Dr. Michael Haykin on their newly released volume, Owen on the Christian Life: Living for the Glory of God in Christ. 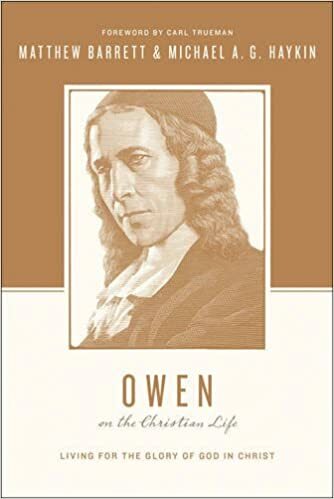 This work, part of Crossway's Theologians on the Christian Life series, explores how Owen's theology informed his deep piety in a way that proves instructive for Christians today. Listen to this interview for more information on this exciting new release. By Dustin Bruce Robert L. Plummer and Matthew D. Haste, Held in Honor: Wisdom for Your Marriage from Voices of the Past (Ross-Shire, Scotland: Christian Focus, 2015), 132 pp., $14.99. Held in Honor represents the combined efforts of AFC Fellow, Matthew Haste, and Southern Seminary professor, Robert Plummer, to provide an accessible treasure trove of biblical wisdom on marriage, as cultivated within the great history of the Christian church. The book contains 50 devotionals inspired by sources from the Patristic, Medieval, Reformation and Puritan, Early Evangelical, and Modern era. Within each devotional one will find a brief introduction to a historical figure, an excerpt from that figure on marriage, and a devotional tying the passage to biblical truth. While these devotionals are brief, they are packed with biblical truth and historical insight. Christianity is the only religion that conforms to the original design that confines men to one wife and that teaches them to treat her with propriety. Go among the enemies of the gospel, and you shall see the woman either reduced to abject slavery, or basely flattered for the vilest of purposes; but in Christian families you may see her treated with honour and respect; treated as a friend, as naturally an equal, a soother of man’s cares, a softener of his griefs, and a partner of his joys. Atheists explain marriage as an accommodation of biological impulses to societal constraints. God tells us that marriage is (among other things) His good gift of companionship to humanity. As Andrew Fuller notes, when a society properly values women as created in the image of God and of equal worth with men, the human race flourishes. The truths and examples found in this book will prove an encouragement to any couple. Get a copy for your nightstand, read it with your spouse, and ask the Lord to bless your efforts. This book is a powerful resource, distilling Christian reflection on marriage throughout the centuries that is sure to strengthen your twenty-first century union. Andrew Fuller, Discourses in Genesis in The Complete Works of Andrew Fuller (Philadelphia: American Baptist Publication Society; 1845 repr., Harrisonburg, VA: Sprinkle, 1988), 3:9–10. Robert L. Plummer and Matthew D. Haste, Held in Honor: Wisdom for Your Marriage from Voices of the Past, (Ross-Shire, Scotland: Christian Focus, 2015), 99. Dustin Bruce lives in Louisville, KY where he is pursuing a PhD in Church History and Biblical Spirituality at Southern Seminary. He is a graduate of Auburn University and Southwestern Seminary. Dustin and his wife, Whitney, originally hail from Alabama. They have two daughters, Marlie and Bella. Wolf-Dieter Hauschild and Volker Henning Drecoll, Pneumatologie in der Alten Kirche (Traditio Christiana, vol.12; Bern: Peter Lang, 2004), lx+372 pages. During the past century, it was sometimes said that the doctrine of the Holy Spirit was the “Cinderella of theology,” given the way that it had been neglected by both systematicians and ecclesiastical historians. Well, if that were a truism for much of the twentieth century, it certainly is not now. Pneumatology has received an enormous amount of attention on both the popular and scholarly levels. Nevertheless, there are still significant areas where there are gaps in our knowledge. This reader by two well-known German patristic experts (Hauschild’s doctoral work was focused on pneumatology—his 1967 dissertation, Die Pneumatomachen, is a standard study of the Pneumatomachian controversy) fills in one of those lacunae: it is a substantial annotated compilation of all of the key sources in the patristic era that deal with the doctrine of the Holy Spirit. Divided into three major sections—“The Spirit and history: church and scripture,” “God and man: illumination, sanctification, and blessedness,” and “The Spirit and God: the Holy Spirit, Jesus Christ, God”—the various patristic sources are given in their original languages (Greek, Latin, Coptic, and Syriac) with a corresponding German translation. It is good to find authors often ignored in patristic compilations, authors such as Aphrahat (c.280–c.345) and Macarius (fl. 380–410). A helpful introductory essay on patristic pneumatology provides a necessary orientation for this collection of sources. There is also a lengthy bibliography of secondary sources on all of the figures included in the volume. This is a tremendous resource, highly recommended for all serious students of the patristic doctrine of the Spirit; it would be especially helpful as a textbook in a doctoral seminar on pneumatology in the Ancient Church.